We’ve all traveled in a plane, whether it was just for business or for vacation. We’ve all been thousands of feet up in the air in the comfort of an airplane admiring the beauty of the ground below us. Unfortunately, none of us will ever be able to experience what it’s like to soar as high as the Ruppell’s Griffon Vulture; the highest flying bird ever recorded. This vulture is one of the largest scavengers alive and without its presence in the skies of Africa; the wilderness would be littered with waste. These birds tend to move in flocks and devour the remains of leftover kills and are useful for recycling rotting flesh. Unfortunately, this species has become endangered as the number of vultures slowly starts to decline. The bird weighs in anywhere from 15-20 pounds and has a wingspan of about 8.5 feet. Birds such as the bar-headed goose (Which have been recorded at approximately 27,000 ft) have been reported to be in close competition to the altitude with the Ruppell’s Vulture. 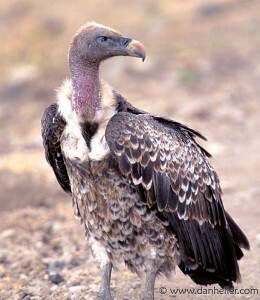 Although this vulture still dominates with a recorded altitude of 36,000 feet. That’s the equivalent to about 120 football fields! To put it in perspective, the average commercial airline plane travels at about 30,000-40,000 ft (There have been reports of the vulture actually being sucked into the engine of a jet). Imagine being able to soar at that height without the use of an airplane! This vulture has an average cruising speed of 22 mph and stays in the air from 6-7 hours every day. Since the vulture is so high up, it has developed a certain type of hemoglobin which makes their oxygen intake much more effective. The bird is not usually seen at its full altitude but it’s still uncertain as to why the vulture flies this high. These birds will fly for incredible distances (up to 90 miles) in order to find food, or nesting materials. This bird is capable of incredible air time which is why it is such a successful scavenger. The combination of the height advantage with their keen eyesight makes for a short game of hide n’ seek. So, how have these high-flying feats been recorded? I’m left wondering what sort of research or observations give us this knowledge. What is the density of air at that altitude? It was interesting to think about the vultures from the point of view of their utility: they keep Africa clean!